The rumbling is the first thing you notice. Tractors, big engines, and antique cars are all fired up, their deep growls punctuated by blasts from a locomotive’s steam whistle. The air smells like a tantalizing mixture of fuel, steam, cut wood, and sugar. There are people and machines everywhere you look. Welcome to the Rough and Tumble Engineers Historical Association in Kinzers, Penn. Located about 10 miles east of Lancaster in the Pennsylvania Dutch countryside, Rough and Tumble is a non-profit organization dedicated to preserving America’s agricultural and industrial history. The museum is staffed entirely by volunteers brought together by their love of old machines and the relics of America’s rural past. Housed in three dozen buildings spread across 33 acres, Rough and Tumble owns the oldest running internal combustion engine in the United States, built in 1867; the second oldest running steam traction engine, built in 1886 and recently restored; stationary and mobile engines powered by steam, propane, and gasoline; a sawmill; a shingle mill; restored tractors by John Deere, IH, and Rumley, among others; threshing machines; and two steam trains, which loop the grounds continuously during events. The grounds are also home to a blacksmith shop, a display of model engines, a shop full of shaft-driven machines, antique cars and trucks, and more. Much, much more. Founded in 1948, Rough and Tumble’s mission is not just to collect these objects but to encourage devotees and the public to interact with the machines and experience history. The organization hosts about 10 events each year, ranging from tractor pulls to blacksmithing school and a harvest show. In fact, Rough and Tumble began not as a museum but as an event: the Threshermen’s Reunion, now the second oldest such gathering in the country. During the late 19th and early 20th centuries, threshermen traveled from farm to farm with their steam threshers to harvest grain. The threshermen and farm families would gather for a celebratory picnic when the harvest was in. The festivities attracted manufacturers and salesmen, who showed off their new farm equipment. 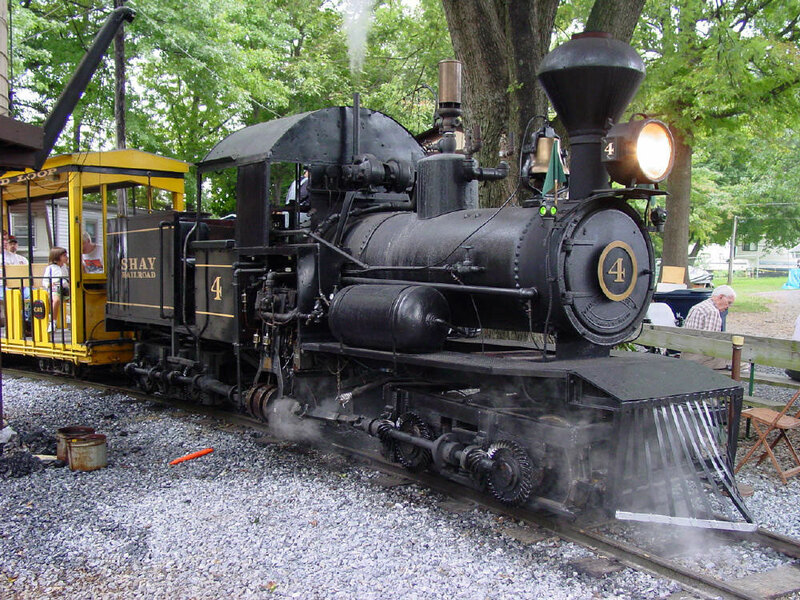 As gas-powered tractors gained popularity, steam-powered engines waned and the Central Pennsylvania threshermen’s association realized its time had passed. The group decided to go out with a huge version of a harvest picnic—the first Threshermen’s Reunion, which was held at Arthur S. Young’s farm equipment dealership, just across the street from Rough and Tumble’s present location. The attendees had such a good time that they founded the museum to perpetuate the reunion as an annual event and, not incidentally, to collect, restore, and exhibit the artifacts of by-gone days. The Threshermen’s Reunion, which takes place each August, and its smaller sister event, the Spring Steam-Up, which occurs in May, are opportunities to see the machines at Rough and Tumble running; enjoy music; watch demonstrations of threshing, milling, plowing, and smithing; ride the railroads; and cheer for tractor games and tractor pulls. They are a chance to smell the steam, feel the soot, hear the engines, and see the work in progress—to experience America’s past in a unique and satisfying way. Join us on May 13 and 14, 2016, for Fox Chapel Publishing’s Open House, which will be held in conjunction with Rough and Tumble’s Spring Steam-Up. The Open House will include carving, scrolling, and turning classes and demonstrations, and plenty of vendors with woodworking tools and materials, plus full access to Rough and Tumble’s machinery and exhibits.